Hugh Lynn, a major Auckland concert promoter and the owner of Mascot Recording Studio in Eden Terrace, founded Warrior Records in 1981. First release was the Penknife Glides double A-side ‘Laugh Or Cry’/‘Taking The Weight Off’, which was branded with the WEA logo, but was a Warrior release in every other way. The label’s second release established the label’s importance – Herbs’ seminal mini-album What’s Be Happen? – a record that perfectly and forevermore defined the sound and ethos of Pacific reggae. 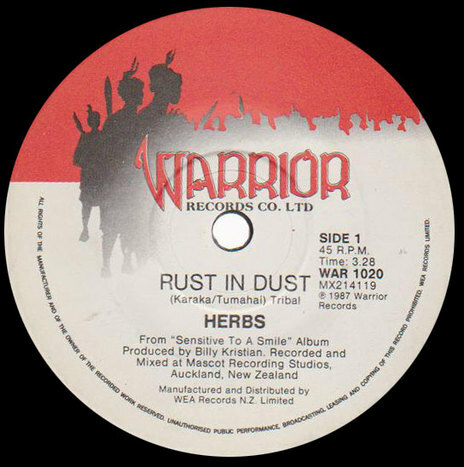 Further releases from Mantra, Diatribe, the Mike McGregor Band, The Pacific Band, Roy Phillips and Shot In The Dark followed, but Warrior will forever be associated with the extraordinary run of singles created by the wide-ranging line-up of talent that went under the name Herbs. ‘Sensitive To A Smile’, ‘Long Ago’ and the staunchly line-in-the-sand statement of ‘French Letter’ were among the most nationally embraced records made in New Zealand in the 1980s and all were massive hits. Herbs were not always embraced by commercial radio at the time. Despite its iconic place in New Zealand history, ‘French Letter’ was largely ignored by New Zealand radio at the time of its release. Warrior was managed day to day by Herb’s original manager Will ‘Ilolahia, and the alliance with Mascot Studios, then one of Auckland’s best recording facilities, meant that the label had access to downtime at the studio, thus ensuring a steady flow of releases. 1988 saw Godzone Beat, a collection of mainstream New Zealand pop-rock bands that seemed to be at odds with the balance of the label’s more ground-breaking catalogue. Warrior’s first incarnation didn’t last out the 1980s as Lynn’s music companies went into receivership and his personal commitments took precedence. Herbs then moved to Warner Music, who had always distributed Warrior. The group’s 1990 album Homegrown was on their own Tribal Records label, although a revived Warrior retained the catalogue and remastered and reissued the band’s albums in 2012 to coincide with Herb’s induction into the New Zealand Music Hall of Fame. In 2013 Warrior is scheduled to issue the soundtrack to the Polynesian Panthers feature length documentary. ~ by admin on 3-June-2013.